Acadia National Park had been on our radar screen for several years, and the time finally came for us to explore it. We were not disappointed! 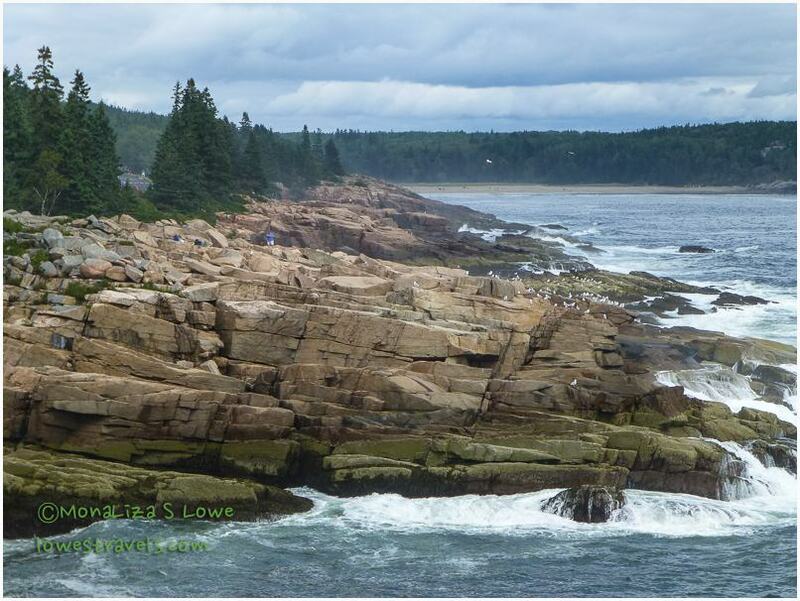 We quickly learned that the park covers much of Mount Desert Island, the largest island off the coast of Maine. 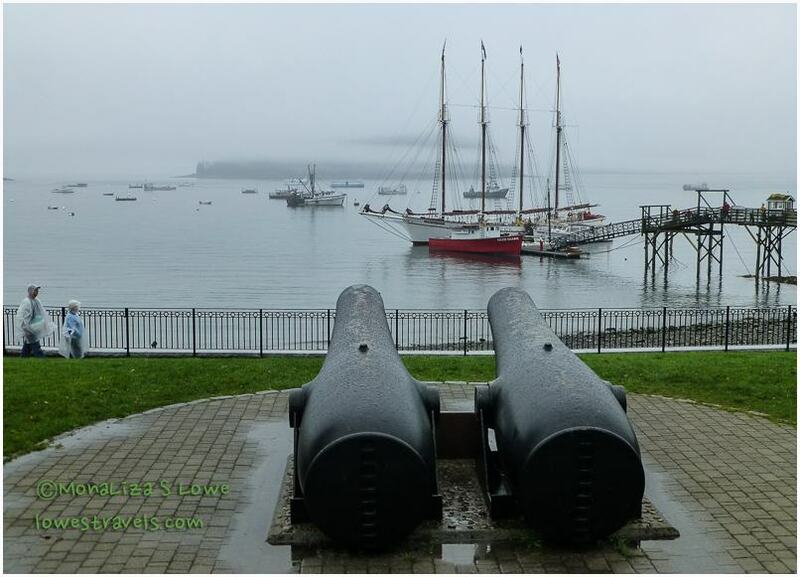 When visiting the park, one should also check out the various other busy little resort towns and harbors that are intertwined with national park land throughout Mount Desert Island. Mount Desert Island in the distance with the imposing Cadillac Mountain to the right. Jeffrey, our campground host at Forest Ridge RV Park (you can see Steve’s park review here), provided us with detailed tips for exploring the island, the park and the surrounding towns and villages via less traveled roads. To do all he suggested we decided to extend our stay to 4 days, as there is much to see and experience here. 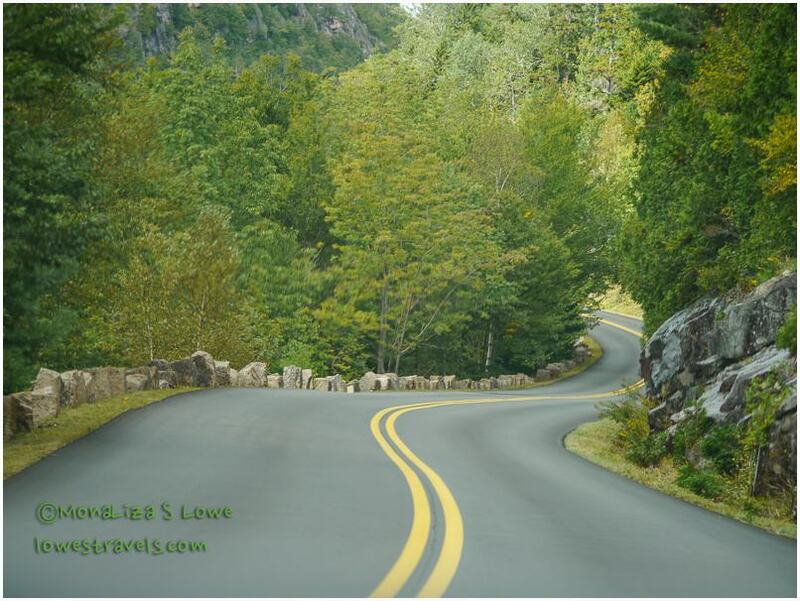 We allowed two days to explore Acadia National Park, to include not only the “must see” but also to discover sceneries and hidden delights of the island. We were also excited to resume our much-needed exercise, since we had been getting rained out a few days earlier. Bar Island is accessible on foot at low tide from Bar Harbor in the foreground. We saw people walking across the channel – cool! 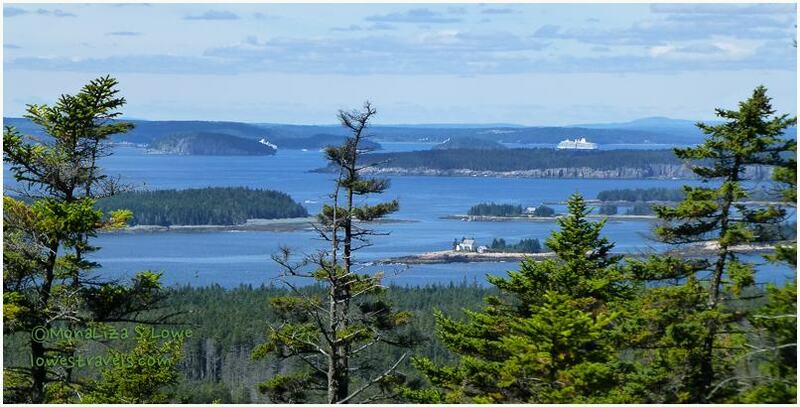 Islands on Frenchman Bay and cruise ships – viewed from Schoodic Head. …and lichens-splotched granite, where I managed to blend in quite well! Looks like I have lichens on my shirt, too! All of the above and much more spectacular scenery were revealed and took our breath away, as we drove two scenic loops to cover the park. 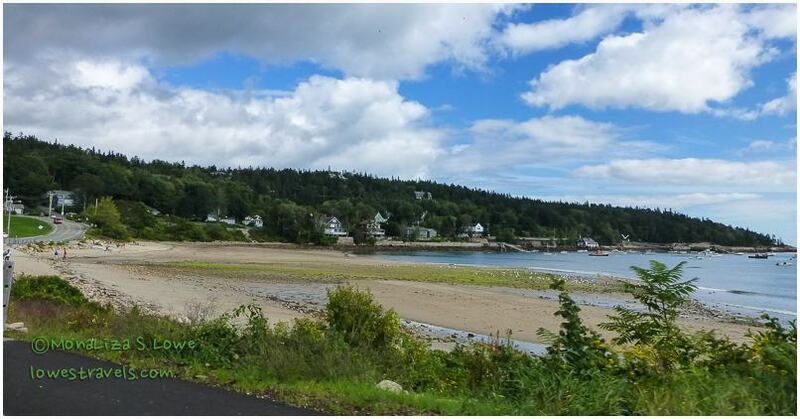 One was the 27-mile scenic loop at Mount Desert Island (the “main” part of the park that everyone visits), and the other is a 6-mile one-way loop at Schoodic Peninsula. Many people don’t make it to the Schoodic Peninsula, but it is at least as beautiful as Mount Desert Island. We just loved the short drive on the new road and took a great hike there, too. Don’t miss the Schoodic Peninsula if you come to this area. Hints of fall on Park Loop Road. We were also excited to hike the Cadillac Mountain South Ridge, which began at the summit and gave us an unimpeded view all the way to the ocean. 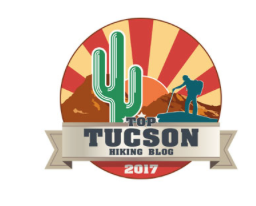 This hike is a bit strenuous, as it requires some “scrambling” on the rocks near the beginning of the trail. It’s one of those hikes where each time you think you’ve reached the final rise, there’s always another one ahead. But the scenery is so worth it! Heading down Cadillac Mountain from the summit toward the ocean. But the car is at the summit, so back up we go! And at Schoodic Peninsula, which is about an hour’s drive from Bar Harbor, we combined the four trails that traverse the area for a great hike. We enjoyed spruce-fir forests and great views of Cadillac Mountain in the distance. At the end of the peninsula we were led to the wind-swept coast, where we noted dark diabase dykes intruding into pink granite ledges. 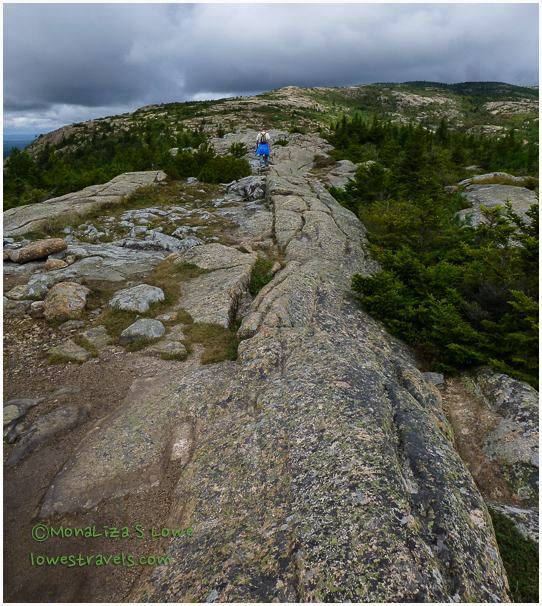 At Schoodic Point – Cadillac Mountain in the background and a large black diabase dyke between granite ledges. 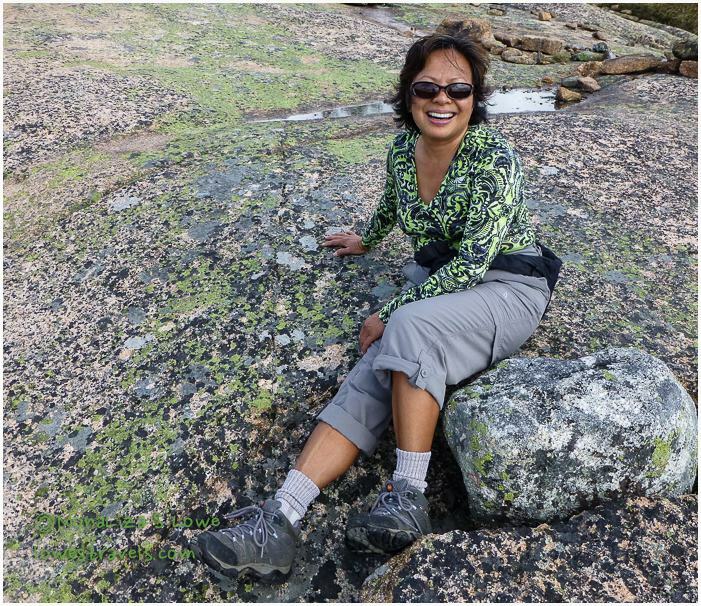 We saw several fascinating lichens that thrive on granite and rocks here. 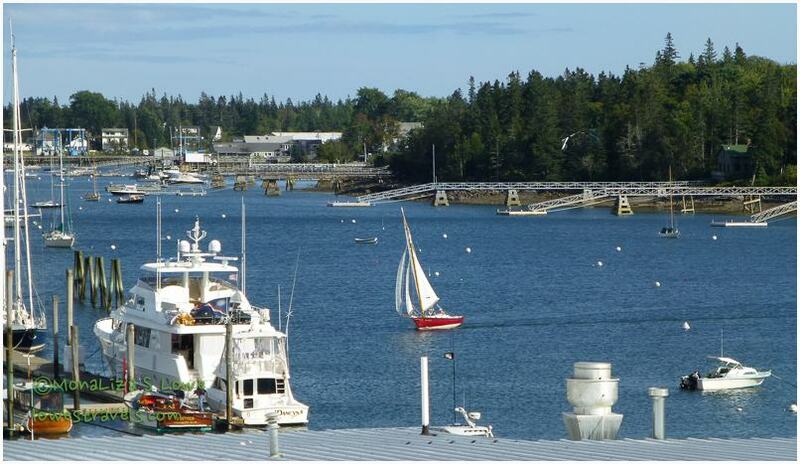 Borders of the park are accented by picturesque harbor villages such as Southwest Harbor, known for its active waterfront. Also, the very popular Bar Harbor is a commercial center and tourist destination that even hosts cruise ships. We also visited Seal Harbor with its lovely beach, and more! We think an interesting fact about Acadia National Park is that it is the first national park whose land was donated entirely by private citizens over many years. Although we missed the fall colors as we were here a couple of weeks too early, this park is high up on the list of our favorite stops so far. Next up: The Penobscot Narrows and more Maine adventures! beautiful…scenery, the commentary…lovely. i’m happy Rommel pointed your blog out recently. cheers to you both. I could hear myself gasping for breath with that Cadillac Mountain. I would stop to catch my breath, *ehem*, the beauty plenty of time. Loving your panoramic shots. I struggle on that one. Glad you had such a great time in Acadia NP. We weren’t into hiking at that point, so we did a lot of bike riding. Excellent workouts riding through the park. Now I guess we need to return so we can hike!! I loved that you had to scramble rocks. Almost looked like a western picture when you climbed Cadillac Mt. Gorgeous photos!! We wanted to ride the Carriage Trail, two days there was not really enough time. Lots of trails too! Oh well next time. 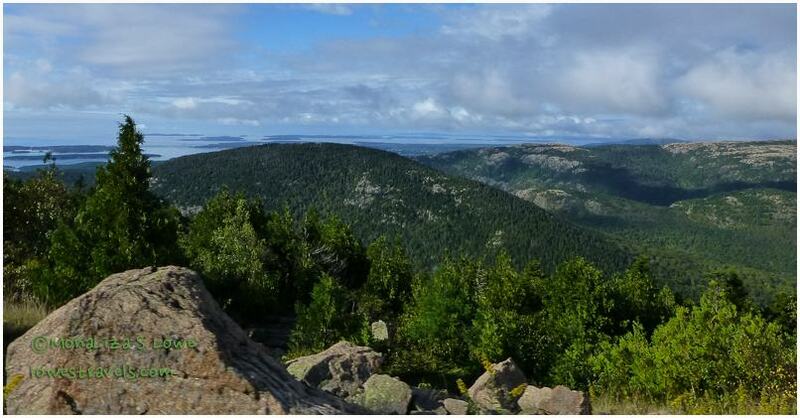 Acadia NP is so diverse not to mention the seafood served from those quaint harbors. Your pictures of Acadia are magnificent. We spent time there last spring before going to the Maritimes. It is a favorite of ours too! I hope in a few years to return with hiking boots on! We wished we stayed a week more to catch fall colors. Yes that’s a great little point and shoot cam. And for sure you will like Acadia NP. Thank you, we are enjoying every moment. Looks like it is one beautiful place! 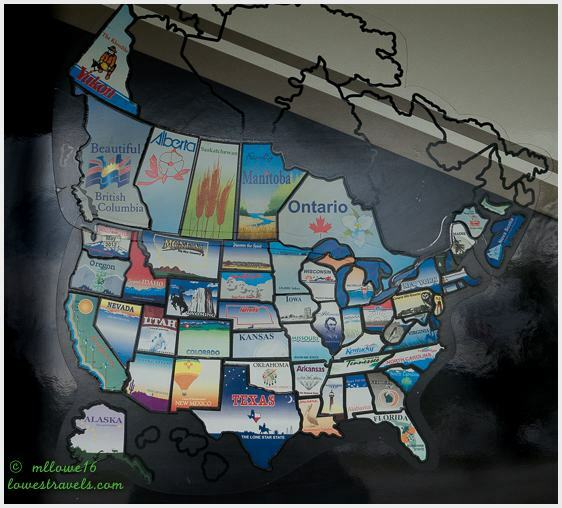 Jodi and I hope to get to that part of the country as well. The weather also looks as though it is holding out for you this time of the year. We had our first snow in Grand Teton National Park yesterday – good thing we are leaving for San Diego later this morning. Safe travels to you. Safe travels too, the park is not only beautiful it is so diverse, there is always something for anyone.